Old cast Iron cake mold, Pewter Springerlie cookie mold, old pewter ice cream mold and old steel and tinned chocolate mold. Recently a customer emailed and asked – “Is my antique metal chocolate mold safe to mold chocolate in?” The answer – Yes absolutely, if it is a chocolate mold. Chocolate molds are made with stamped steel either tinned (before WWII) or nickel clad (after WWII). Both of these processes were done to protect the steel from rust and line the mold with a nonporous surface to help the chocolate release. (The Steel is similar to the material our pots and pans are made of.) I have seen many molds listed as chocolate when they are in fact ice cream molds, barley candy/clear toy, cookie molds or even cast iron cake molds. 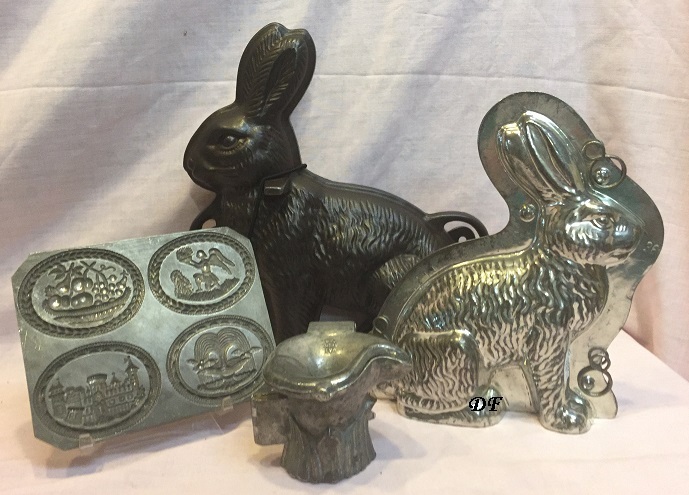 In the picture above you can see four of the many old molds that have been listed at auctions and various other places as a chocolate mold only the sitting rabbit on the right is an old chocolate mold. The lesson – make sure what you have is a chocolate mold. Check out our FAQ page for more info. 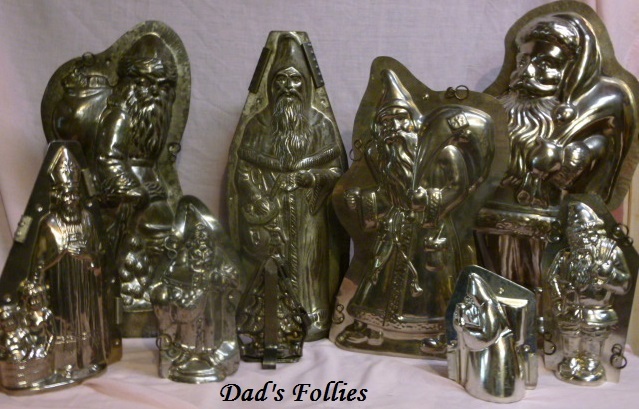 This entry was posted in Uncategorized and tagged Antique, chocolate molds, Metal, old. Hey! This post couldn’t be written any better! Reading through this post reminds me of my previous room mate! He always kept talking about this. I will forward this post to him. Fairly certain he will have a good read. Thank you for sharing! I really happy to find this website on bing, just what I was looking for : D as well saved to my bookmarks. hope it was of some help. Thank you for your comment. I just want to tell you that I am all new to blogs and absolutely enjoyed this blog. Probably I’m want to bookmark your website . You absolutely come with really good writings. Cheers for revealing your web page. I’m working on more, if there is a specific question or subject just let me know. I’ll see what I can do.